Optima Sales Director was delighted to talk to Intralogistics Magazine again about managing multiple ecommerce channels for their May edition. Following the success of our article on page 22 of the April Intralogistics Magazine, Neil was asked his opinion again, this time about managing multiple ecommerce channels. Thanks to the rise of sites like Amazon, eBay, as well as the many different ecommerce channels , it’s not surprising that businesses want their products to be where their customers are looking. Companies are also using different websites for different types of products, perhaps with a keyword rich domain name, or a problem-solving domain name as well as the main company or brand name ecommerce site. Neil talks about managing multiple ecommerce channels and some of the challenges and benefits, and how an Optima WMS software can help. Interested? 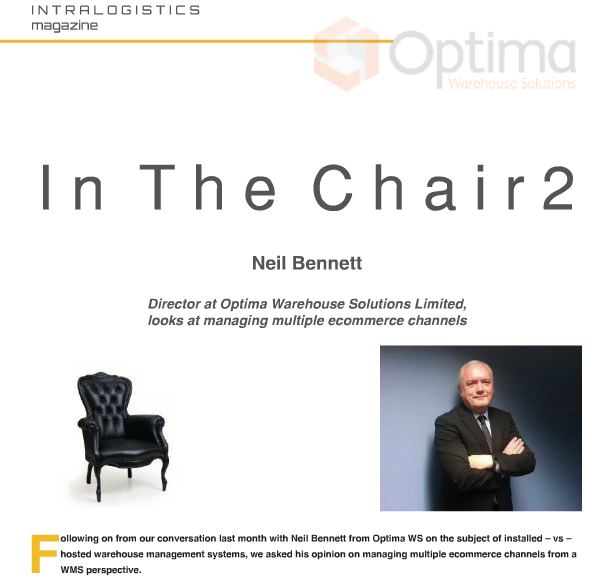 Read the managing multiple ecommerce channels article on page 24 of May’s Intralogistics Magazine and find out more about Optima Optimiser WMS software, to see how it can help your warehouse and your business if you want help managing multiple ecommerce sites. If you want to know more about Optimiser WMS software, then Contact Us on +44 (0) 1270 500 777 today.